Time for a new contest! 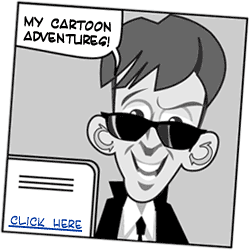 Write an exciting spy story where you play the main role as a secret agent. This is your chance to shine in your very own spy story, and win great spy prizes! Make it a short spy story, or a long one. It doesn't really matter. As long as you really enjoy what you've written, it's all good (yes, there are other contest rules but when it comes to story, your imagination is the limit). First Prize: a Sphere Spy Watch. This must be one of the coolest spy gadgets on the planet. It makes great videos (no sound alas, as it would make the watch illegal to use in many countries) and looks coooooool! Second Prize: Spy Gear Spy Video Trakr. This programmable car is a perfect sidekick for spy missions that need covert surveillance. It has so many features, that we can't even list them all here. Third Prize: Spy Strike Laser Dueling System by Spy Net. We have no less than 3 winners that will win this exciting laser shooting game! Most file-types will be ok, but if I can't read it I may ask you to send it in a different format, ok? Write a great spy story with you in it. 5 prizes can be won! Stay on top of what's happening with this contest, and subscribe to 'Messages from UNCLE' to get new missions and other spy information. It has all the latest intel on what's going on at T.S.S. HQ. Note: if you're age 13 or less, don't share your information without the express permission of your parents! I promise to use it only to send you Messages from U.N.C.L.E..